50 years ago today, on 6 April 1968, a day before a decisive meeting between FC Barcelona and Real Madrid at Camp Nou, there was terrible news for the Club: the Uruguayan defender Julio César Benítez had passed away. The fans were distraught given that Benítez was a much loved figure amongst the Barça faithful, not only for his excellence on the pitch but also for his open and positive character. Born in Montevideo, Uruguay on 1 October 1940, Benítez made his First Division debut in his home country at the age of just 16. 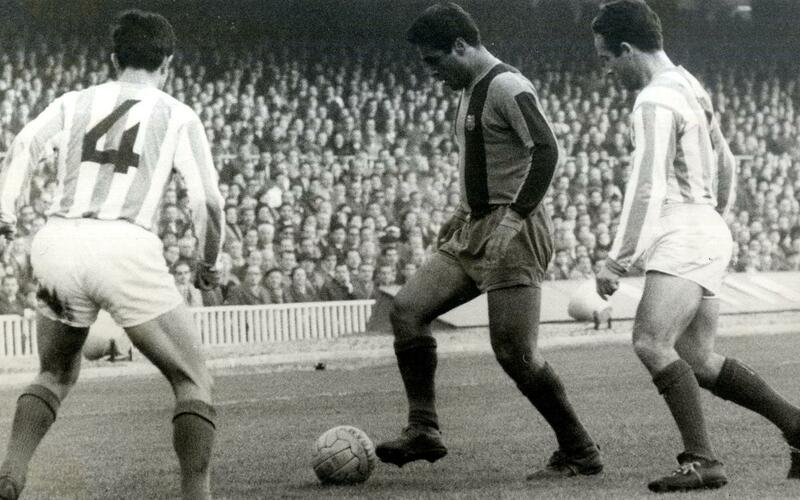 He moved to Spain as a teenager and after spells with Valladolid and Zaragoza, he joined Barça in August 1961. His versatility saw him play in various positions before becoming a fixture in the team at right back. Benítez was a technically gifted and creative defender whose passion and will to win often landed him in trouble with referees. As a Barça player Benítez made 259 appearances and scored 31 goals and is considered as one of the greatest right backs in the Club’s history. More than 150,000 visited the chapel of rest set up in the Presidential Area of the Camp Nou between 10 o’clock in the morning of 7 April to 3 o’clock in the afternoon the next day. It was one of the most impressive demonstrations of mourning ever seen in the city, which culminated in his burial at the Les Corts cemetery, next to the Camp Nou.